Flat board guitar pedal boards BY CASEMAN. Custom flat pedalboards and optional matching cases. Simple, elegant design built to any size. Available in any size as a single level board or with one of our custom made hinged risers. Double riser boards are also done once in a while as well as kit's that allow you the riser and handle position of your choice. All necessary fixings and hardware are provided. 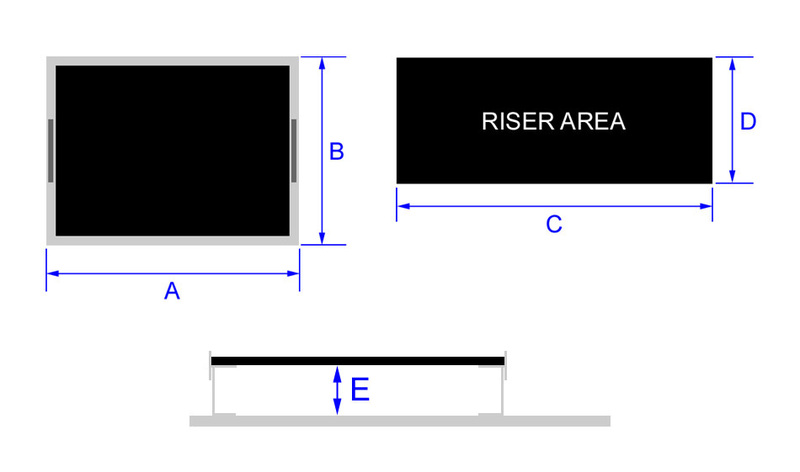 53mm, 63mm and 83mm are the available clearance heights underneath our custom risers. Capping reduces the black area of the main board by 30mm in both the width and depth area. For example if your main board measures 500mm x 400mm then the black area will measure 470mm x 370mm. Just the basic's are covered here. That's what email is for! This will allow for pedal heights of roughly 65mm with no under board storage height. This will allow for pedal heights of roughly 65mm with 50mm under board storage height. If your pedals are taller than 65mm we simply put less foam underneath the board. Total customisation is possible with this case model. Extra tall pedal height allowance, hinged riser boards and taller underneath heights can all be catered to.